Solomon Heydenfeldt was born in Charleston, South Carolina, in 1816. His mother was Sephardic and his father was Ashkenazic. Heydenfeldt attended college in Pennsylvania and studied law in Charleston. He was admitted to the Bar in 1837 at Mont­gomery, Alabama. He practiced law in Ala­bama and Georgia. 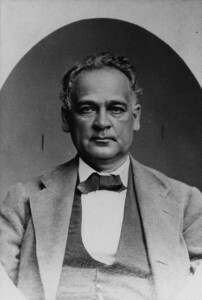 Solomon Heydenfeldt moved to San Francisco in 1850. He soon developed a large legal practice and was recognized as a community leader. Heydenfeldt was elected to the three-man California Supreme Court in 1851. Justice Heydenfeldt served as Supreme Court Justice for five years, 1852 to 1857. His years on the Court were very productive. He wrote forty-five opinions, which are collected in volumes 2 to 7 of California Reports. Justice Heydenfeldt’s opinions left an indelible impression on California law. He left the Court in 1857 due to difficulty in supporting his family on the low judicial salary. Heydenfeldt resumed law practice in San Francisco. In 1858, he successfully defended a Sacra­mento Jew who had been discriminated against for violating the Sunday Laws when he kept the Jewish Sabbath. On January 15, 1859, he presided at the San Francisco mass meeting held to protest the abduction and forced conversion of the Mortara child of Bologna, Italy. For decades considered one of the outstanding members of the California Bar, Justice Solomon Heydenfeldt was an outspoken Southern sympa­thizer, and refused to take the “Test Oath” during the Civil War. This necessitated his withdrawal from law practice for a time, during which he became a business advisor to many firms. As a result, Heydenfeldt accumu­lated a substantial fortune, much of which he gave to innu­merable charities. He was also interested in early child education, and helped found the first kindergarten in San Francisco. Solomon Heydenfeldt died in 1870 and is interred at Home of Peace Cemetery, Colma, California. William M. Kramer, “Solomon Heydenfeldt (1816-1890): Supreme Court Judge,” Western States Jewish History 8/3. William M. Kramer, “Solomon Heydenfeldt: Earliest Important Jewish Attorney in California” Western States Jewish History 23/2. Noron B. Stern, “Justice Solomon Heydenfeldt,” Western States Jewish History 41/1.